Our June fishout for the Hex Hatch turned out to be the best trip for the hatch.The hatch hadn't started near camp so most fished in the cove around to the right of the public boat launch near the dam. Thursday evening's hatch was the best for most of our group, with Karilyn Duarte, Jon Keeny, Joe Piazza all landing fish, some with nymphs, others with emerger patterns. I fished on the other side of the boat launch to the left in an area right off the picnic area. I played out more line to get 35' out to start finning backwards so I could start my slow 4" strips. Once the line was taut and I made two strips, I felt that I was caught on the bottom, but then the "bottom" started to move. Turned out it was a scrappy, hard fighting 15-1/2" small-mouthed black bass. After another ten minutes using the same fly and technique, I hooked another good fighting fish. This time I had to get it onto the reel. It was a nice 20" German Brown trout. Later, when I tried my Hex emerger, I had a good strike and a 3 second fight before the fish broke me off. The same thing happened to me on the second fishout. Looks like I better get some new tippet material. This is also a reminder to others to replace your old tippet material, especially if they have been in your vest for a long time in your hot car. 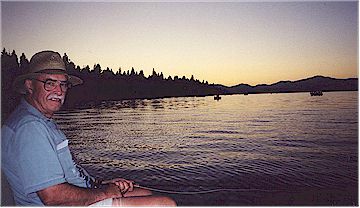 This is the first year I can remember of fish at Almanor breaking me off. The hatch outside of our camp boat launch started on Saturday, June 26 in a big way, but only a few fish were rising. They hadn't keyed on them yet. With the hot weather between the two fishouts, that hatch was on it's last legs when we got there on Thursday, July 8th. Ken Tetzel landed one trout while a few others like Art Harris, Mike Wintroath, Tom Lamb and myself all got hits or were broken off by fish. The hatch came off very late that night. Friday and Saturday saw the number of hex and strikes drop way off, indicating the end of the hatch. We all had fun on both fishouts. A lot of good food was prepared by all. Because so many people bring great appetizers, salads and desserts we are going to just have pot-luck gatherings at the future fishouts. I won't be cooking spaghetti, because by the time we get to it, everybody is already full. It will make it easier for everyone. We have been trying to plan the fishout to hit the hatch just right. Next year I plan to change the week I spend at Almanor. I'll go up on Wednesday, June 22 and stay to the following Wednesday or Thursday, June 29 or 30th just before the big crowds come for the 4th of July holiday weekend. This timeframe should be a lot closer to the best part of the hatch. We did have a big surprise in camp on July 11th at 2:30 AM in the morning, when a bear came into camp and turned over a cooler and some storage boxes trying to get at the cooler like cream cheese, passed up a left-over tri-tip roast and went for the bread. We'll have to take better precautions in the future. Hey, Tom Lamb - heard you had a hard time getting back to sleep that night. My thanks to all those who made the fishout a success. We'll see you there next year.